You can't stop cats from scratching, but you can dictate what they scratch. You and your cat probably don't agree on what items around the home are suitable for intense scratching. The answer is simple, provide them with their own furniture to scratch. Why do cats need to scratch? Cats have a natural instinct to scratch for a variety of reasons. It removes the outermost layer of their claws and reveals the healthier, sharper claws beneath. It gives them a chance to stretch out their muscles and pads, and also acts as a method of marking territory. 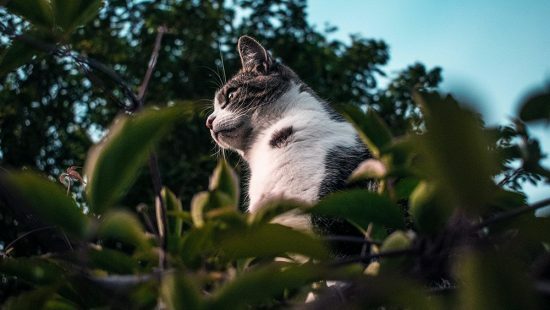 When cats scratch an object, they leave a visible marking and a scent from the glands in their pads that warn other cats away. You can’t stop cats from scratching, but you can dictate what they scratch. 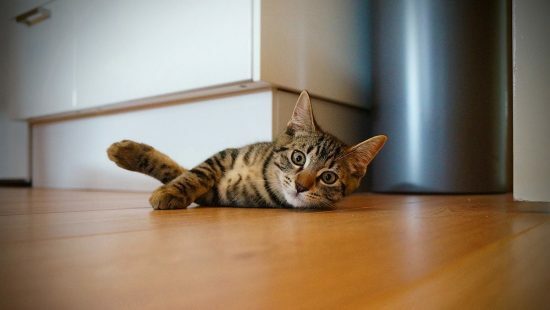 You and your cat probably don’t agree on what items around the home are suitable for intense scratching. Buying a scratch post could be the key to saving your furniture from a lifetime of scratching and claw marks. Cats tend to be attracted to coarse, textured materials that make for satisfying scratching. If there’s no clear suitable object to scratch, they’re more than happy to turn their attention towards coffee tables and leather sofas. By introducing a scratching post, you’re presenting an alternative to them. Most posts are made from a texture called sisal rope (I’m sure you’ll recognize it by sight) which is super attractive for cats eager to get their claws into something. It’s also extraordinarily durable, unlike your curtains. You should place the post where your cat wants it. Placing it in prominent spots around the house will increase the usage of the post and keep them away from other objects. Try not to place it close to litter or food. We placed ours near our front door, since our cat generally wakes up and comes to greet us when we come home from work and has a scratch then. When they stop, direct them to the place you want them to scratch. You won’t have to do this for long before they get the message and turn their attention to their new scratching post. Don’t punish cats retrospectively for having scratched furniture. While it can be extremely frustrating, scolding your cat after the incident has taken place won’t teach them not to scratch. If you catch your cat in the act, then discourage them in an appropriate manner so they associate scratching with a negative reaction. Furniture for cats is becoming more and more popular as it becomes more affordable. 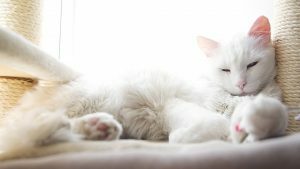 Modern cat furniture provides healthy benefits for your cat and solves the issue of scratching around the house, they’re also preferred because they look great in most homes. Again, don’t shout directly at your cat. It can lead to them avoiding you all together and a whole host of unwanted behavior. What scratching post is best? It’s recommended that you look for scratching posts that allow your cat to stretch fully. In most cases, 50cm or so is a good height. Having a suitable and sturdy post is key in ensuring your cat prefers scratching it rather than anything else. Some cat owners with multiple cats, or cats that are hard to sway, tend to opt for a cat tree or climbing post. This provides them with an entertaining environment that they can mark as their own territory.